One of my goals for 2019 is to post more blog entries, last year I spent my time working on my webpage to get it to match my brand and my personality. It was a lofty goal but I have the workings of a webpage and store. I also want my post to be relevant and entertaining to my readers. So when I saw Art Elements’s moon monthly challenge I had to give it a try with the hope that it would give the push I need. I am so excited to participate in Art Elements‘ Moon Challenge. 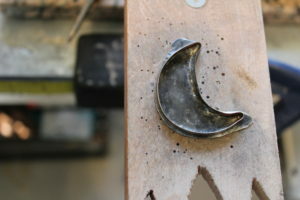 As soon as I heard about this months challenge I knew I wanted to make the moon element in metal and resin, with that in mind I created a necklace. The challenge reminded me of a time when my son was 4 years old. We were driving along at night and he asked me, “Why is that moon all cut up?” It was a crescent moon. He was at that age of figuring out the world around him. He always amazed me with his observations. 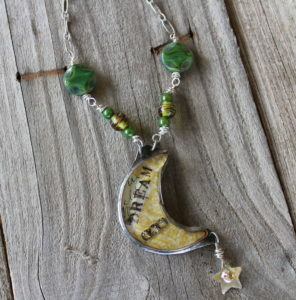 My necklace is his cut-up moon, it is full of dreams and discover like his 4-year-old mind. I have a little trick I use in forming some of my bezel shapes, I use clay cutters from Hobby Lobby. I take my bezel wire and wrap the wire around the shape. Make sure your bezel wire end is cut straight with a flush cutter. Form the wire around the clay cutter and mark where the wire meets the first edge. Cut with the flush cutters to make the second cut straight. You will need to meet up both ends so they are aligned. 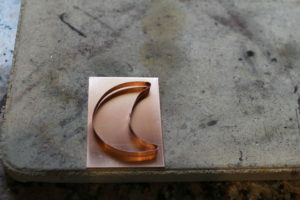 Using the formed moon bezel as measurement cut the copper sheet to fit the moon shape. You will want to leave enough room on the plate to add a bail or any dangles you might want. 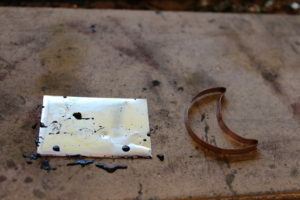 Once you have your backplate cut you will want to sand the copper to remove any oil from your fingers. Scrub after with a green scrubby to remove any debris from sanding. Dry completely and brush on a light layer of flux. Flood the copper plate with the solder covering the plate. I use my torch to melt the solder onto the back plate, be careful to not overheat. 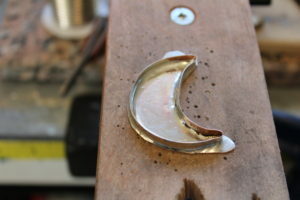 Once the plate is covered with solder, clean with soap and water and brush on a light layer of flux covering the plate and the moon shaped bezel wire. Using your torch quickly heat up solder until your moon bezel wire is attached. Make sure your edges of the bezel wire are lined up. You will have to use the tweezers to make sure the moon is in the place you want on the backplate. 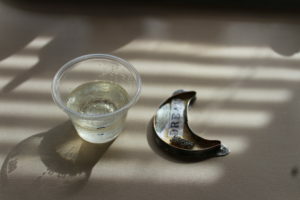 Scrub the piece with soap and water to remove flux. If you want to adjust the size of the backplate you can saw or trim away what you want. 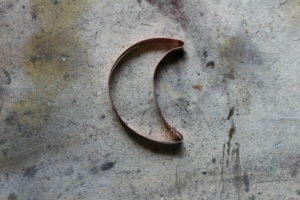 After you have cut or sawed out your moon brush on a patina to give an aged look. For this step, you will have to play with bits and pieces of embellishments to the inside of your bezel. I’ll use some kind of ephemera for the back of the plate. 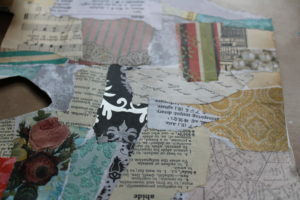 Sometimes I make my own collage of papers as I did here. I also like to add a bit of bling (I’m a Texas girl after all). I also made the little stars that dangle. from the bottom. I am excited about this next part because I am trying out a new resin. This resin can be cured in the oven for an hour at 170 degrees. Mix your resin according to its manufacturer instructions. To help pop any bubbles I will hold a lighter stick above my piece until all bubbles are gone. Once the resin is completely cured you can attach a chain. I like making what I call a “junk chain” with bits of different chain and beads for my resin pendants. It has been a while since I’ve done a resin pendant from scratch since I mainly work with sterling silver now. I had a lot of fun working through the process. The new resin made it enjoyable because it is almost instant gratification, no need to wait till the next day for your resin to cure. I hope you enjoyed this month’s moon challenge and learned something new! Stay tuned for more challenges. Be sure and check out the other moon challenge from these some incredible talented artist. Click on their names below to be directed to their webpage. That is really neat, such a beautiful pendant and a lovely chain to go with it. Thank you so much for sharing the trick with the bezel and the cookie cutter, too! Thank you for sharing the process – I love the idea of using clay cutters for your shapes (ingenious!). Love how it all turned out! OOOOH, very nice! Thanks for the tutorial, I enjoyed seeing your process! While I’m still afraid of solder, you made it look manageable! That’s a talent! Fantastic!! I love, love, love this tutorial. I’ll be saving and sharing it. You’ve made creating a bezel look easy! And your final design is wonderful. I can’t wait to see more from you. Oh, and the website is lovely. I need to get on working on mine soon. Thanks for the inspiration. Fantastic job! 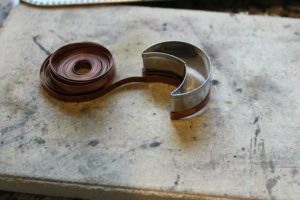 I love the idea of using the clay cutter to form your bezel. And your stars for embellishment are the perfect addition. Thanks for the tutorial. Your moon turned out great and your necklace is very cute! That’s a really lovely design, I enjoyed reading about your process… Thanks for the tutorial! I love your pendant and it was so generous to write up a tutorial for others to make one too. The cookie cutter idea to form the bezel is super clever! Thanks for participating in the theme challenge this month and for reading Art Elements. I hope you’ll participate in future challenges! I love the way you made a detailed tutorial as part of your Reveal!! Thanks for showing us your steps. Did you you use silver solder? Your piece is fantastic. Thank you, Alysen. I had fun participating in the challenge. I used what they call soft solder it is silver in color but not silver solder. 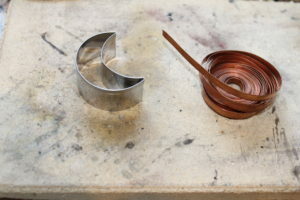 I left a link to where I get it in the materials section of the blog. Kids observations are the best. Still to this day I can’t see a crescent moon without seeing the cheshire cat’s grin, and I know that stems from my very early childhood. Metal and resin both are scary to me, so I love that your tutorial removes some of that mystery. The necklace is beautiful as well! I do hope you will play along with us again soon! Ooh, some good tips for making bezels in your post, thank you for the cookie cutter idea! 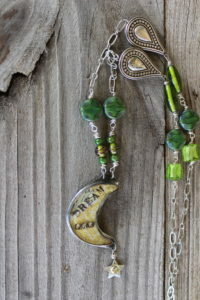 The moon pendant is wonderful and I love the junk chain it hangs from. Your handcrafted pendant is amazing! 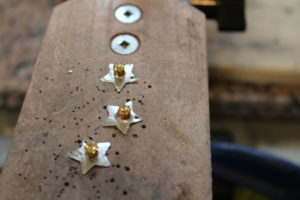 And thank you for the tutorial, I tried soldering once without success but am determined to pursue it further. The tiny stars are very beautiful, too! 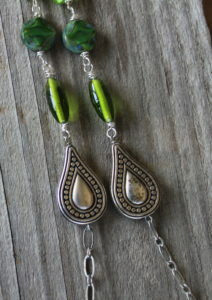 That is such a sweet inspiration for the pendant, and I loved going through your tutorial. (Thank you for sharing!) 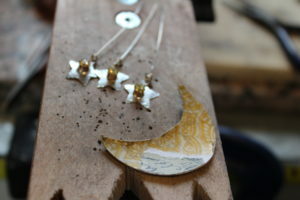 The tiny dangling star makes a perfect companion for the moon! I thoroughly enjoyed seeing all the steps in your process. Looks great! Glad you could join us this month! Your moon pendant is just darling! Thanks for sharing your process with us. What a smart cookie to think of using tiny cookie cutters to form some of your shapes. Maybe someday I’ll get brave and try this! Good gracious – this is absolutely enchanting!! Thank you for sharing a tutorial with it – if I get brave, I’d love to experiment with this technique. Your tip about using the clay cutters to shape the bezel is genius!! Your work is perfection. Great post and wonderful necklace. 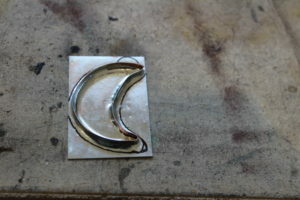 I love your son’s young observation of a crescent moon and how you turned the story into the pendant. Your description of the process makes soldering sound so easy I’m tempted to try it. But I suspect my attempts would need much practice. I LOVE how you made your moon, using the cookie cutter was genius! Thank you so much for sharing and your necklace is beautiful! Oh, the “cut up moon,” … that made me smile. I love hearing how little ones phrase things when they see things new to them! I’m in awe of the necklace you made — it’s beautiful! And, as I’m a Word Nerd, I especially love that you incorporated a printed word into it.